Our family, consisting of white Southern Protestants, has observed Chinese New Year for the last 15 years. Why, one might ask? And the answer is the little baby girl we brought home from China. We want her to be proud of her heritage and her homeland, so celebrating the biggest holiday of the Chinese year is one way we do that. When the kids were little, I began to make Chinese food (as best I could) on the first day of CNY. We also decorated the room with red paper and drawings, red being the color of celebration in China. I presented them with special red envelopes with a dollar inside. We pored over children’s books about the activities and beliefs behind the customs. Once we moved to Greensboro a few years back, the Greensboro Chinese Association greatly expanded our observance of this event. 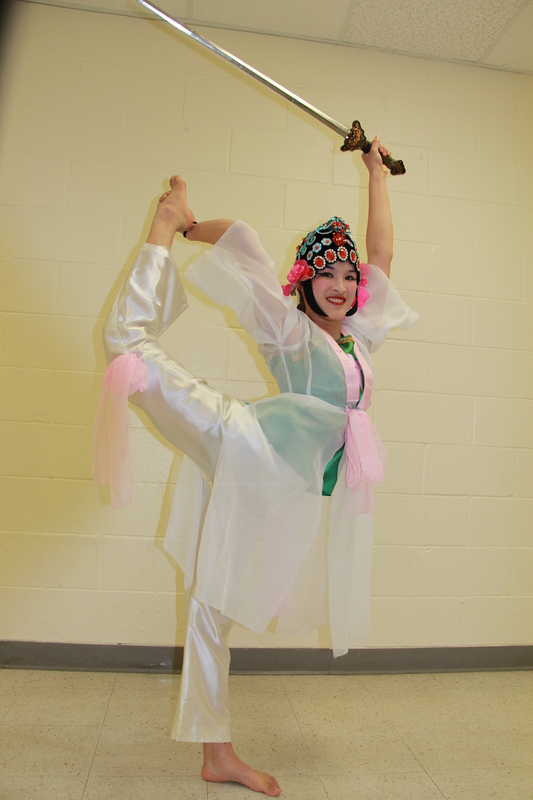 Ava joined the Chinese folk dance troupe, and began to dance each year in the grand celebration. The annual event took place this past Saturday, with Ava and her friends dancing once again. Today’s picture shows my lovely daughter preparing for a dance with a rather heavy sword. We enjoyed the lion dance, traditional Chinese music, kung fu demonstrations, calligraphy, Chinese food, and other ways to celebrate this ancient holiday. Both my children will once again today receive traditional red envelopes with money inside. Chinese New Year evolves out of a desire to begin again – to put the winter and darkness behind and to prepare for the coming spring and signs of new life. The ancestors and history are also to be honored and celebrated. Numerous rites and rituals help participants remember their own ancestors and the nation’s cultural history. These observances are a way to tie the past with the desire to be ready for the future. And I love how many activities display readiness during this two week celebration (which actually just begins today) – purchasing new clothes, cleaning the house from top to bottom, getting one’s hair cut, making special food items which honor the past or symbolize new beginnings. Rice – the most basic of foods in China – symbolizes wealth, luck, and a relationship between the Heavens and humanity. Fresh fruits symbolize life and new beginnings. Each item is prepared with special intent, and absorbed into the body with a special thanksgiving for the things which it represents. Each year our family thinks about new beginnings. We honor the past – we tell the story of our little China baby and the ways she has grown. We once again recount that God planned for her to be in our family – she’s such a perfect fit. We reminisce about the elders who are no longer with us, and how much they loved our new baby. We proclaim that any ancestor who didn’t know her would have loved her as much as we do. And we explore possibilities and options for the future – college, career plans, possible partner and children one day. These two weeks are a grand time. I’ll head to Dynasty Asian Market later this afternoon to stock up on items for our family Chinese feast later. The lady at the checkout is always more than helpful – it’s rather obvious that the white woman in front of her doesn’t know a whole lot about Chinese cooking – and I appreciate her generosity in helping me learn. My family and I will once again honor this wonderful tradition, remembering the past and anxiously anticipating the future.